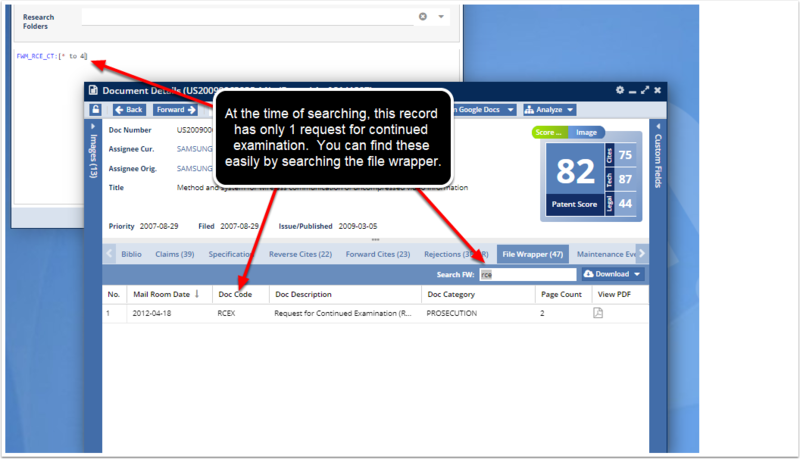 File Wrapper - Total Number of Requests for Continued Examination (FWM_RCE_CT) searches for the total number of requests for continued examination in the file wrapper of an application or patent. In other words, if the file wrapper has 3 requests for continued examination, and you search for FWM_RCE_CT:3, the application or patent with this file wrapper will be one of the applications or patents returned with the search result. FWM_RCE_CT:[20 to *] --> Query matches all US patents or applications where the total number of requests for continued examination in the file wrapper is 20 or more. This is a very rare case and probably means that the applications are very important to the applicant/original assignee. FWM_RCE_CT:[* to 4] --> Query matches all US patent and applications where the total number of requests for continued examination in the file wrapper is 3 or less.